November 15, 2018. 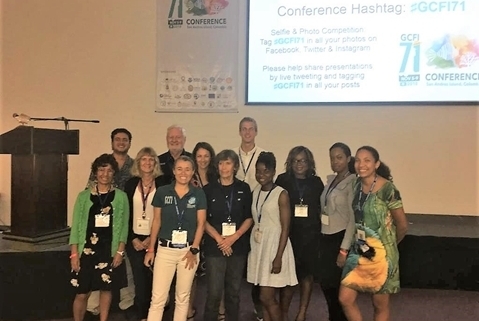 New developments in research, monitoring and adaptation to the sargassum influx in the Gulf of Mexico and Caribbean region were recently shared during the 71st conference of the Gulf and Caribbean Fisheries Institute (GCFI). Since the first influx affected the Caribbean region in 2011, sargassum has emerged as an important topic of exchange among scientists, coastal and marine natural resource managers, fishers, diverse government agencies, NGOs, the private sector and the tourism industry. GCFI has been at the forefront of sharing information about the pelagic sargassum influx. First appearing as a topic of discussion in 2011 at GCFI64 and again featuring in presentations at GCFI65, GCFI67, GCFI68 and GCFI70, the first time that a main conference session at GCFI focused on the sargassum influx was in 2016 at GCFI69 in Grand Cayman. 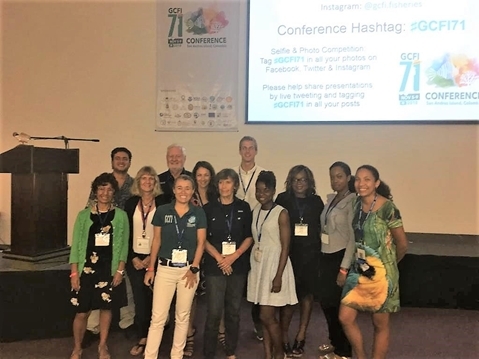 At this year’s GCFI71 meeting in San Andres, Colombia, the sargassum influx was the topic of the largest number of presenters to date at a GCFI conference, with 10 oral presentations and nine posters. The theme of the GCFI71 conference was ‘Tourism in the Caribbean: challenges for the management of fisheries and coral reef ecosystems of the region’ and from the outset sargassum featured highly. In his opening keynote address, Jake Kheel from Grupo Puntacana Foundation highlighted the sargassum influx as a key challenge faced by the tourism sector and he described sargassum management actions being piloted in the Dominican Republic. “From the growing science of sargassum prediction and forecasting, to standardizing monitoring, sharing about adaptation measures and management approaches, and considering productive uses for sargassum, this was a notable session at GCFI,” she added. The sargassum session opened with a presentation from the GCFI71 host country about the calculation of the quantity of sargassum that arrived on the island of San Andres during 2018. Presented by PhD student Julian Prato Valderrama from the Caribbean Campus of the National University of Colombia, the method could be re-applied by others who seek to also assess and compare arrivals of sargassum on their shores. A regular contributor to sargassum at GCFI, physical oceanographer Dr. Don Johnson of the University of Southern Mississippi, along with colleagues Dr. Jim Franks and Dr. Chaumin Hu, shared the first insights into the Caribbean sargassum influx at past GCFI meetings. This year he gave an update about efforts to track and predict sargassum influxes and their impacts on pelagic fisheries, such as the flying fish industry in Barbados which has been negatively impacted by the sargassum influx. Ms. Marion Sutton from CLS, part of a consortium working with the European Space Agency, presented about new capabilities for early detection to enable the development of more precise forecasting tools that can be used by Caribbean governments and agencies to manage the sargassum influx. Building on efforts to predict sargassum influxes, Dr. Hazel Oxenford presented work underway with Dr. Shelly-Ann Cox at the Centre for Resource Management and Environmental Studies (CERMES) of the University of the West Indies, supported by the CC4FISH project, to develop a Sargassum Outlook Bulletin. Intended for use by resource managers and coastal stakeholders, the bulletin aims to provide sub-regional alerts about the expected occurrence of a sargassum influx and help trigger national and local response, with corresponding technical and outreach information. Presentations by Mr. Andrew Maurer of North Carolina State University about impacts of the sargassum influx on sea turtles in Antigua & Barbuda, by Ms. Charleen Charles from CERMES about the costs of sargassum to the tourism industry in Barbados, and by Dr. Sabine Engel about the cascading effects of sargassum on the economy of Bonaire, all served to underscore the seriousness of the ecological and socio-economic impacts of the sargassum influx. With the catchphrase “show me the money”, Ms. Charles shared findings about average willingness to pay among tourists to Barbados of just over US$20 to assist in the management of sargassum, and an average wi llingness among tourists to travel 10-15 minutes to access an alternative beach without sargassum. Reflecting the growing regional experience in facing up to the challenges of sargassum, Ms. Richeda Speede from CERMES presented about new practices that are being seen among Caribbean fishers, and innovations in gear and vessels as the fishing sector adapts to the influx of sargassum. Ms. Carla Daniel from the Food and Agriculture Organization leant a note of optimism to the session, “from horror to hope”, by presenting about evolving uses for sargassum in the region. The audience took the opportunity to raise questions about the implications of possible heavy metal content and absorption of pesticides by sargassum, which served to highlight the need for further research. Dr. Ligia Collado-Vides from Florida International University closed the session by sharing a proposed regional network for citizen participation in sampling and standardized monitoring of sargassum influxes, with scope for a common index to be used to categorize the scale of a sargassum influx. Sargassum featured through to the very end of the GCFI71 conference when the winning student poster was announced in the closing ceremony as ‘Sargassum Landing and Movement as a Function of North Atlantic Oscillation Variation and pH Differentials’ by Mariah McBride of Texas A&M University at Galveston. The GCFI71 sargassum abstracts can be found at https://www.gcfi.org/gcfi_71-conference/ and past extended abstracts can be found in the searchable database of online GCFI proceedings at https://proceedings.gcfi.org/ For more information please contact [email protected].